If you write a caption to this please say that I love cantaloupe, absolutely love it, almost as much asI loved staying here with you. 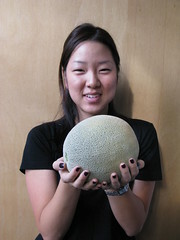 In fact, I wish I could stay and eat this cantaloupe when it’s ripe, just a few short days from now. Alas, I must go back to LA. But I’ll be back!!! And when I am, you best have a cantaloupe waiting for me.